PWR BTTM's Pageant is an excellent, varied collection of indie rock songs that explicate queerness in our current moment. Rock ’n’ Roll music is often thought of a place where rebels and outsiders can find their home, but after nearly a 60-year history, the form, and nearly all its offshoots have been commodified to a degree where affectation and implication become much more important than authenticity. It’s also a place that’s largely been a vehicle for cis gender heterosexual white men. With this in mind, it’s easy to reduce a band like PWR BTTM, whose members Ben Hopkins and Liv Hopkins both identify as queer, as being little more than that -- their identity is directly proportional to their significance. But, listening to their second album, Pageant, it feels like the band has crafted something truly canonical, even on first listen. Pageant feels both old and new -- the sounds here run from power pop in the vein of Cheap Trick to thick, fuzzy rave-ups evocative of Dinosaur Jr., and the emotional intimacy of the best Smiths songs. But their lyrical point of view, which explicates the queer experience within our current cultural moment, is what makes them transcend any sonic influences. In the same way that Morrissey or Jonathan Richman brought in new points of view into the rock lexicon, Hopkins and Bruce render a too rarely presented perspective in full color. PWR BTTM’s take on well-worn rock tropes is evident on the album-opening “Silly”, which starts with an insistent hammer-on guitar that sounds reminiscent of AC/DC’s “Thunderstruck” and builds into a triumphant cathartic release by its end. The lyrics are sincere, but not twee, in their inspection of ‘silly’ feelings: “Was I silly to love you with the force of my heart / When that’s queer and alive and so sad from the start.” A lot of Pageant plays like this, but the band twists the formula well to the Hopkins and Bruce’s individual voices, as they take turns singing lead on the tracks. Hopkins’s vocals are more varied and easily pretty of the two, wrapping around the notes on “Pageant” and “Oh Boy” in a way that communicates deep yearning through an “Aw, shucks” timidity that’s charming. But he’s also capable of opening up, like on the great anthem, “Big Beautiful Day”, which is a rallying cry against the culture of toxic masculinity that implores listeners to speak truth to power by “being your damn self". Bruce’s vocals are a bit more specific, self-aware and affected, sometimes recalling John Linnell from They Might Be Giants. Still, Bruce's style is dynamic, shifting from a cute, but cutting take on “Answer My Text” to a truly beautiful performance on the closer “Styrofoam". Taken together, Hopkins and Bruce don’t only play foil to each other, but also represent intersectional views of queerness, both through lyrics and culture that their voices evoke. You can hear the campiness in “Answer My Text” turn inside out on “Sissy”, another Bruce vocal, which makes the campiness strength back onto the leering eyes that judged them. Pageant is a tight 13 songs that run a total of 34 minutes. There isn’t a song that outstays its welcome as each offer something distinct. Some of the best ones do a lot with little. The aforementioned “Pageant” augments its acoustic bedroom opening with the introduced of multi-tracked electric guitars and a touch of horns like something by Girls. “Won’t”, maybe the album’s best melding of power and pop, masters the loud-quiet-loud aesthetic with a chorus that lifts you off the ground. 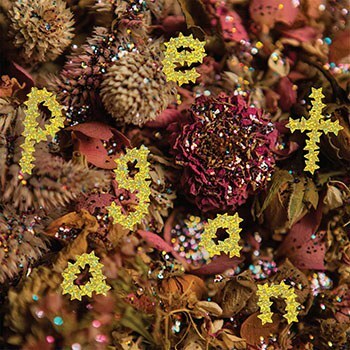 The songs on Pageant are immediately catchy on first listen, but they have a melodic, lyrical, and instrumental power that will make them evergreen for years to come. PWR BTTM make expressly queer music, but they touch on universal yearning that we all share. More power to them.